- Oshi ---> Oshi is a relatively new burger place right on Main Street that is one of my new favorite places to eat (read my blog post about it here). This is the type of place where you know you're going to get good service and good food all the time. They have a pretty solid selection of milkshakes on their menu that can be made with alcohol or without. My favorite is the Godzilla. - A. Schwab ---> When Memphians hear A. Schwab, most of them think general store. In addition to being a great shop to find something interested located on Beale Street, they also have a (relatively newish) turn of the century soda fountain (read my blog post about it here)! The perfect place to stop in with your Valentine. 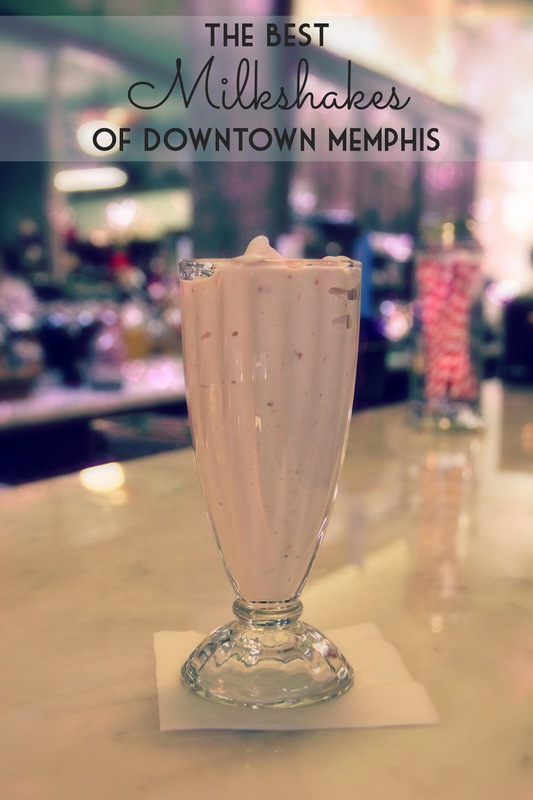 - The Arcade ---> Milkshakes and diners just go together so it's no surprise that The Arcade, Memphis' oldest restaurant, has amazing milkshakes. - Dyer's Burgers ---> Dyer's is known for their burgers made in 100 year old grease (yes, you read that right), however, their milkshakes are delicious and (as far as I know) no grease is involved.... thankfully. - Aldo's Pizza Pies ---> Ok, hear me out... this last one isn't a milkshake BUT it's similar. Aldo's has the best root beer float that I have ever had. I think it has to do with the fact that their root beer comes out of a tap. Amazing. We've been known to stop into Aldo's just for floats. Now, I realllly want a milkshake. I'm craving one now!! I have yet to make it to Oshi, I think when my Mom comes into town in a few weeks I'm going to head over there with her, I'll definitely have to grab a shake there too. That one in the pic looks yummy! !